The Inflatable Industry Purchasing Group is a non-profit group for owners of inflatable rentals units. Members must be engaged in the manufacturing, distribution, rental or operation of inflatable amusement products in the continental United States, adhere to safe business practices, maintain proper records and comply with standards and recommendations promulgated by the group or the program administrator. The following links will take you to other sites and resources for information about the inflatable and ride rental business. If you have any questions or need additional information, feel free to contact us anytime at 904.545.8112, or email us at info@amazingjax.com. Thanks! We have a selection of units from Happy Jump, Inc. They are a premier supplier of inflatable units and accessories. To see their complete product line, click the link above. For an amazing selection of inflatable rides and events, this web site has it all. A high end supplier of units, this company is on the leading edge of production and innovation in the bounce, slide and ride business. Another great supplier of inflatables, Ninja jump has licensed gear from most major studios, Disney, etc.— innovative products and accessories. 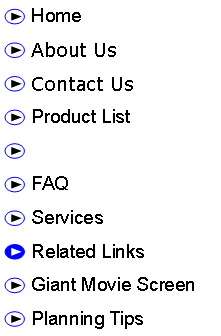 Click to see their complete product line.